The Gazebo Performance Series is hosted weekly during the Summer months in downtown Greendale. 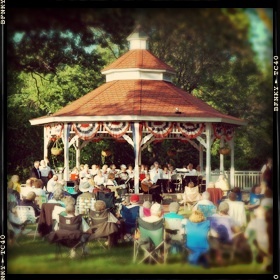 Each Saturday at 7:00pm, the GEA brings local musical talent to the park at the Gazebo. Pack a cooler, bring your blankets & chairs to the park and settle in for the fun! * In the event of rain, please join us at the Greendale High School in the Multipurpose Room (cafeteria).